How does a truck with 36,000HP sound? Okay, to be fair, it's a jet truck. But, those afterburners would definitely keep people from sitting up your a%$! The Shockwave Jet Truck isn't Euro 5, we can tell you that much, but what it does offer is a record top speed of 605km/h and a 6.63 second quarter mile. A combined 36,000HP and 21,000 lbs of thrust come from three enormous J34-48 Pratt & Whitney jet engines originally out of the USA Navy T2 Buckeye. 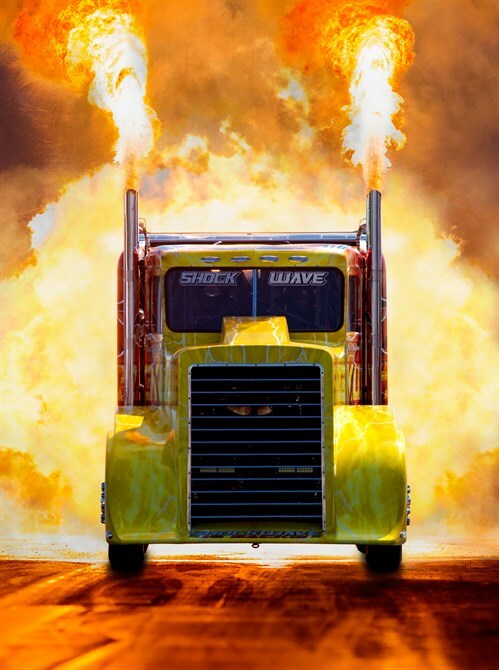 The Shockwave Jet Truck is owned by Darnell Racing Enterprises, Inc based in Springfield in the States, and it's driven by the luckiest man alive, Chris Darnell. We'd love to see this thing up close in person, but for now, we'll leave you with some videos!